The origin of C. sativus has long been the subject of speculation and research, as this knowledge would enable breeders to introduce genetic diversity into the otherwise genetically uniform plant species. 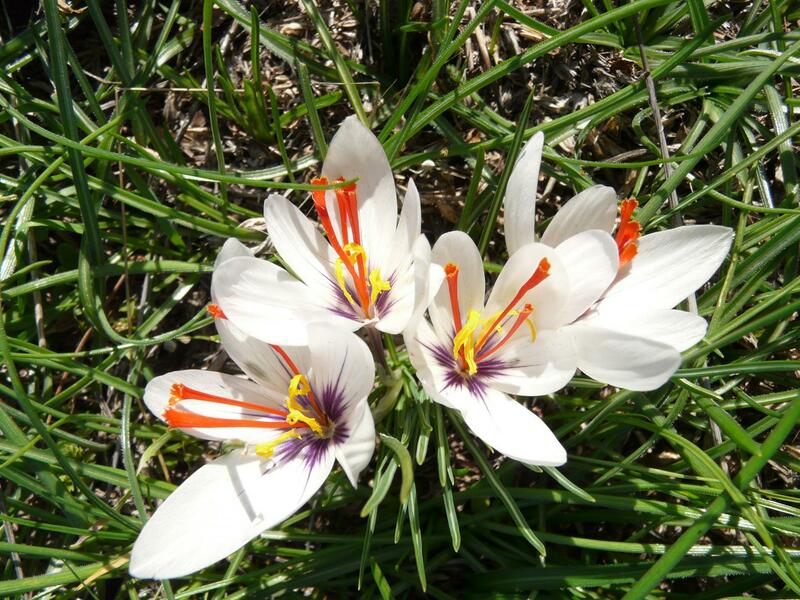 Two new studies have now shown that the saffron crocus originated from a Greek ancestor. Since ancient times, saffron has been giving dishes a golden-yellow hue and an aromatic flavour. The use of the stigmas of the saffron crocus (Crocus sativus) is depicted in frescos from Crete and Santorini, which are as old as 3600 years. Nowadays, the valuable plant is mainly cultivated in Iran accounting for more than 90% of the saffron production. Due to its hardiness, small batches of the saffron crocus are even grown and harvested in more unlikely countries such as Switzerland and Germany. Possibly partially due to its widespread agricultural adoption, the origin of saffron has until recently been a subject of speculation. Now, two independent studies have been able to trace the roots of C. sativus back to Greece. The saffron crocus is a triploid and male-sterile plant. This means that the plant can only be propagated vegetatively. In this case, parts of the corms (bulb-like structures of the stem) of the saffron plants are broken off and then these daughter-corms are used to grow new adult plants. A consequence of this form of reproduction is that there is no room for improving saffron quality by crossing different cultivars. Thus all modern saffron plants are genetically nearly identical. Knowing the origin, in particular the originating plant species, would enable saffron breeders to use new genotypes to broaden the diversity of the saffron crocus. Researchers of the Leibniz Institute of Plant Genetics and Crop Plant Research (IPK Gatersleben) decided to tackle the mystery of saffron’s origin, by comparing molecular markers of wild crocus species with those of our cultivated saffron crocus. In the research group of Frank Blattner, plant material was obtained through sample-collecting excursions from native stands of all relevant species. Through the analyses of genome-wide single-nucleotide polymorphisms (SNPs) and the investigation of the chloroplast genomes of the different crocus species, the researchers were able to pinpoint the species with the highest genetic similarity to C. sativus. As such, the wild crocus species C. cartwrightianus from Greece was identified as the sole progenitor of the modern saffron plant, and the area in the vicinity of the Greek capital Athens as the region where it evolved. C. cartwrightianus had already been postulated as a possible progenitor of C. sativus, however the high intra-specific genetic diversity present in C. cartwrightianus had led to unclear results during previous investigations. Now, in the IPK-study, an unambiguous total of 99.3% of the alleles of C. sativus could be recovered in C. cartwrightianus. These results were confirmed by an independent complementary study performed by researchers at TU Dresden. The Dresden scientists in Thomas Schmidt’s group performed comparative chromosome analysis with fluorescence in situ hybridization (FISH) of different crocus species, and could also demonstrate that C. sativus resulted from the fusion of the genomes of two C. cartwrightianus plants, an event called “autopolyploidisation”. A slight surprise for all of the involved researchers was that the main growing regions for saffron are clearly located outside the distribution area of its progenitor C. cartwrightianus, with C. sativus prospering in drier regions and at higher elevations. They suspect that the explanation to this also lies within the origin story of saffron – it was probably the genome-fusing autopolyploidisation event that led to ecological shift of saffron, away from the habitats in the Mediterranean vegetation zone of Greece. Saffron, the dried stigmas of the saffron crocus (Crocus sativus), is the most expensive spice worldwide. The male-sterile triploid plant has been propagated vegetatively for at least 3600 years, but the origin of the saffron crocus have long been subject of speculation. A study analysing the chloroplast genomes and genome-wide DNA polymorphisms in crocus species was performed at the IPK Gatersleben. It shows that saffron evolved in Attica, Greece, through the combination of two different genotypes of the wild crocus C. cartwrightianus. The findings are supported by a recent independent study performed at TU Dresden. This clarification of the parent species will probably enable plant breeder to overcome the low genetic diversity of the saffron crocus by creating new saffron genotypes with C. cartwrightianus individuals. Studies available through https://doi.org/10.1016/j.ympev.2019.03.022 and https://doi.org/10.1111/nph.15715.